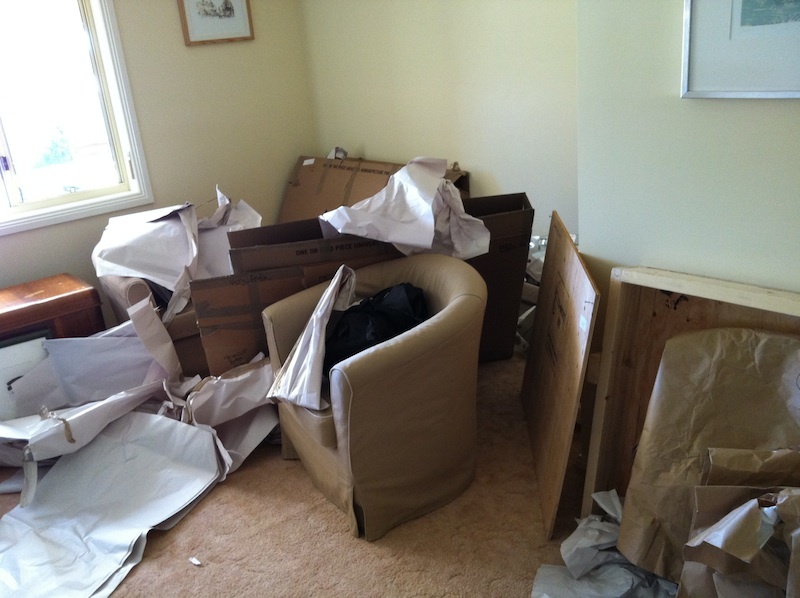 Regular readers will remember that it was a long time ago…several posts ago in blog terms…that we talked about our furniture being packed into the sea can and starting its long, slow journey to Australia. 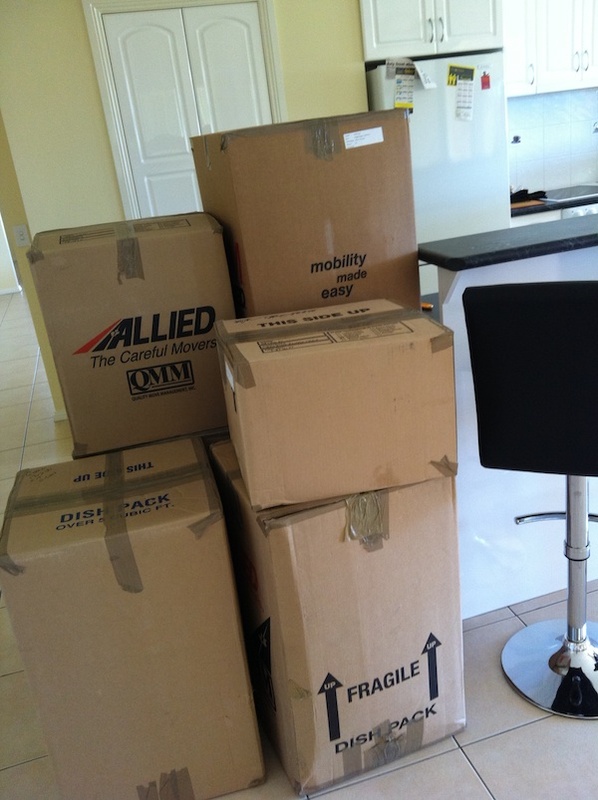 And now, more than 11 weeks later, the can arrived in Wagga and our stuff is back in our possession. We had a couple of updates on its transit over time, but this actually confused us. In late July, we were told that the ship was on schedule, and would dock in Sydney on August 2. Then, a while later, we received a letter asking us to authorize the company to submit our stuff to customs, and to provide a credit card number for any incidentals, such as quarantine fees. It also said that the ship, now identified to us as Northern Practise, would hit Sydney on August 9. Not sure why the date was changed. This is the Northern Practise. Is one of those containers our stuff? One day, Dan goes on to the internet and googles Northern Practise. Here’s some details: It is registered in Liberia (aren’t most ships these days? ), is 264 metres long and 32 metres wide, and registered as carrying Hazard A (Major) cargo. Hmmm, did this put our stuff in any danger? Would our couch glow with radiation on arrival? Or did they put it on this ship because they felt our goods were hazardous? But more interesting, he also found out that the ship’s last known port had been Hong Kong, and its position at that time was just east of Wollongong, NSW…south of Sydney. It seemed to have missed its stop! The ship’s posted destination was Melbourne, where it went, offloaded (we assume) some containers, then turned around and went back to Sydney. Who knew you can track all this stuff on the web (and for you shipping geeks out there, here is the link; you can follow the NP’s schedule as it continues on its journey)! It finally arrived in Sydney early on the 10th of August, unloaded, and took off for Brissy (that’s Aussie for Brisbane). The really strange thing about the tracking process is that you can look back a couple of months, and there is no record of the Northern Practise having been in Vancouver in June to pick up our container; it seems to pretty much stay in the South Pacific, floating back and forth between China (mainland and Hong Kong) and south and eastern Australia. So we have no idea what happened. Maybe the container left Vancouver on one ship, went to China and got transferred, or maybe the ship’s history was wrong. Who knows? The container that arrived wasn't the same one that left Edmonton. This means that Australian customs moved everything, but from what we can figure out they didn't take anything. Anyway, after all that, the container got unloaded in Sydney and the quarantine/customs people took a look. Not finding anyone in the container who needed to be transferred to Malaysia (Aussies will get this…) or any agricultural products, they actually sped through it pretty quick and less than 2 weeks later Lisa got a call saying it would arrive in Wagga some time on August 24; if they drove it down from Sydney on the 23rd, we would have it in the morning, otherwise it would be early afternoon. On the 23rd, they confirmed that it was on the way, and delivery would be in the morning. Around 9:30 am, Craig and Bob show up with our stuff. They were great! Craig was obviously in charge; in his early to mid-40s, he was the driver, and spent a lot of time on the phone while Bob, who was probably around 20 yo, unloaded and carried most of the heavy stuff. They were from Melbourne, and had been working in Wodonga because there wasn’t much going on in Melbourne; this week Wodonga wasn’t too busy either so they got a job in Wagga. Who knew that Wagga was the hot place for movers these days? It didn't take Bob and Craig too long to unpack these boxes. They just put everything on the counter and we tried to keep up with them, getting stuff into cupboards. So…we don’t know much about regional Australian accents, but there are three possibilities here: people from Melbourne have a strong accent; working class people in Australia have a strong accent; or working class people from Melbourne have a strong accent. Whichever it was, we had a really hard time understanding these guys. Craig made a joke about his brother, who married a Canadian and moved to Canada (somewhere in BC, we think), and then came back. Craig told him he came back with a Canadian accent, and the brother said “I don’t have an accent, but you sure do!” And did he ever…or it was just a lot of bogan pronunciation and slang he was using. Whichever it was, thanks to Lisa’s interpretive skills (Dan spent much of the day trying to comprehend what was going on), most things got placed in the proper room and we had some fun chats with some genuine, hard-working blokes who got to unpack (and therefore see) our UMC Canadian stuff (they probably saw more kitchen gadgets than they knew existed, and thought that the way we treated our cats was hilarious! Craig couldn’t stop talking about the fact that they had their own water fountain. We’re sure that they would have had some good laughs over a beer in the pub that evening, talking about the crazy Canadians’ stuff). It took a few hours to unload and unpack, and then Craig and Bob left us to put everything away. Most things arrived unscathed, though there were a few casualties and wounds. Our bed’s footboard is scratched, the glass in one picture frame is broken, one wine glass, some xmas ornaments are broken, etc. And we will be putting in a claim with Allied over these things. It will be interesting to see what happens. Most of the damage is from bad packing by the Edmonton crew. Lisa realized that they even broke something in Edmonton and then tossed the pieces in a box, as she found a piece of a porcelain xmas figurine in the basement when we left our old house. Didn’t think anything of it at the time… until we found the rest of the ornament in the box here in our new place. The packing materials pretty much filled the container when they loaded it up to take back to the depot. The cats were locked up in the ‘family’ area of the house (i.e., the extra bedrooms and bathroom area), where not much was going to be delivered. Lester did manage to escape a couple of times, because he has mastered the art of opening pocket doors, but we caught him before he got outside. We are thrilled that our art, for the most part…just that one broken piece of glass…made it, fully intact. The irreplaceable pieces by Alex Janvier and Maureen Enns, that we purchased custom-built crates for (thanks for that tip, FFG! ), arrived unscathed. This is what we woke up to the next morning. It looked like a tornado hit. And then, after a long day of helping Bob and Craig, telling them where to put things, organizing cupboards, unpacking boxes (they were supposed to do it all, but Dan just couldn’t stand around and watch them work; Lisa finally allowed him to put the feet on a bookshelf – much to Bob’s dismay! – and start unpacking a few books), and inspecting everything, we finally, after 81 days of friends’ place in Edmonton, hotels and BnBs in the UK, airplane seats, The Lawson, and then a futon, we finally got to sleep in our own bed. But neither of us really slept that first night because it was a bit unfamiliar, and there was a huge pile of cats who also hadn’t had their bed for months! Dan also couldn’t sleep because it was so loud – all that purring, non-stop, through the night. Night two…we were out for hours! Next up, some more unpacking and ‘setting up house’ in detail. 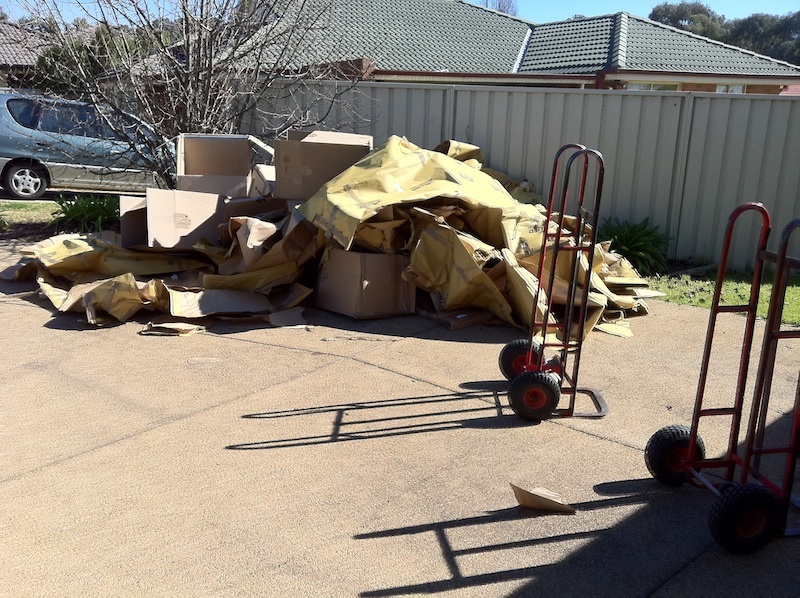 This entry was posted in art, Australia, cats, decluttering, Moving. Bookmark the permalink.